The London brewing scene is booming at the moment and The Rake Bar's annual London beer week festival provided a great opportunity to showcase some of what the likes of Kernel (incidentally, the backdrop to this blog is a photo of their shiny new brewery), Fuller's, Winsdor & Eton and Redemption are producing. It also provided a platform for some startup breweries to get in on the action and a stormy Sunday afternoon was the perfect excuse to sit in The Rake's cosy bar and sample some beer from the upcoming Weird Beard Brewing Company (@weirdbeard_brew). Weird Beard is not yet a commercial brewery but their operation is starting to shape up nicely with premises secured and brewing plans being drawn up. The brewery is the brain child of Director and Brewer Gregg Irwin (@dredpenguin) and Brewer Bryan Spooner (@weirdbeardbryan), both established home brewers who were delighted to take home awards from the London and South East Craft Beer Festival back in November 2011 (see Gregg's blog post for details). 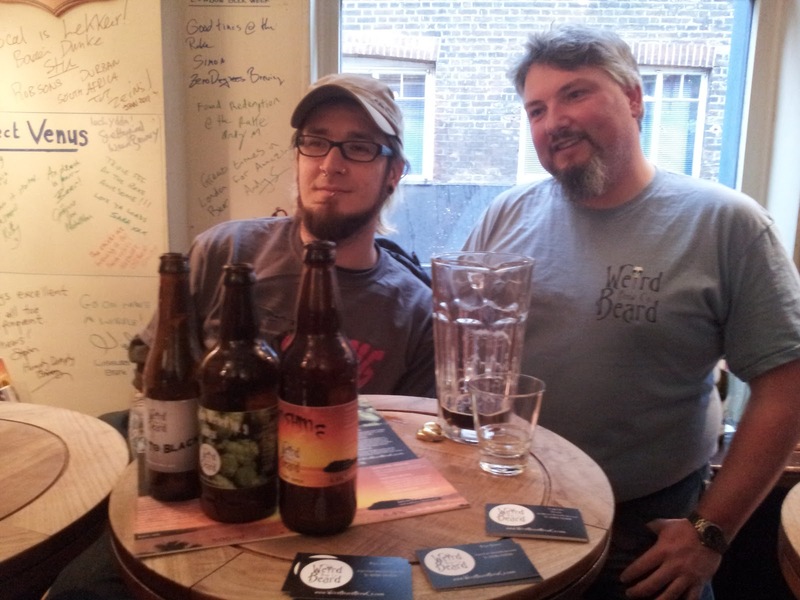 Encouraged by the feedback their beers were getting and the support from London Amateur Brewers, they decided to take the bold step of starting a commercial brewery, as wittily explained on their blog. The journey to where they are today has not been an easy one. 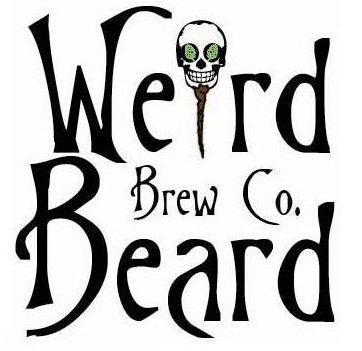 Weird Beard will be sharing a space and equipment with Ellenberg's Brewery, another start up. Their initial planned location, under a railway arch between South Harrow and Rayners Lane, fell victim to TfL red tape and undue delays with securing a lease. Not wanting to waste any more time chasing their tails, the two breweries sought out a new location and recently secured an industrial unit beside the Grand Union Canal in Hanwell. They hope to be in within a month or so and from there will acquire either used or new equipment and start the process of building it out (any breweries out there who are looking to sell used vessels, please get in touch with Gregg - they're looking to build a 10BBL plant). They're tentatively aiming to be fully up and running by September. So, what about the beer!? Gregg and Bryan brought along three beers to sample. A single-hop pale ale brewed with the Junga hop (from Poland). Sunshine Saison and Fade To Black, a Cascadian dark ale or black IPA if you prefer. All three were met with approval by those gathered in the bar. The Junga hop pale ale had a delightful nose filled with sweet marmalade notes. It was conditioned perfectly with a refreshing carbonation fizzing orange flavours over the tongue leading to a subtle bitter finish. The Saison had a nose dominated by the French saison yeast with a hint of lemon and peppery spice from the Pacific Jade hops. Again, a lively carbonation washed it around the mouth where there was more lemon to be found. This was really refreshing and my sample glass was empty within a couple of minutes - very enjoyable. The last beer and the one most of those present seemed to like the most was the Black IPA. The dry hopping was exquisite and really inviting with a combination of Sorachi, Citra and Amarillo providing lovely citrus aroma. The taste was one of more citrus, especially grapefruit and lemon underpinned by the coffee notes of the dark malts. The finish was long and bitter. This was a very good beer indeed and one I hope makes it to their core range. Gregg explained some of the challenges of ramping up from brewing in his shed to full commercial scale. The New Zealand hops (especially Nelson Sauvin) they want for some of their core beers are in short supply with orders being taken months in advance. He hopes they can secure a few kilos and has committed a fair chunk of their budget to a large order. However, their orders understandably sit behind those of established customers. 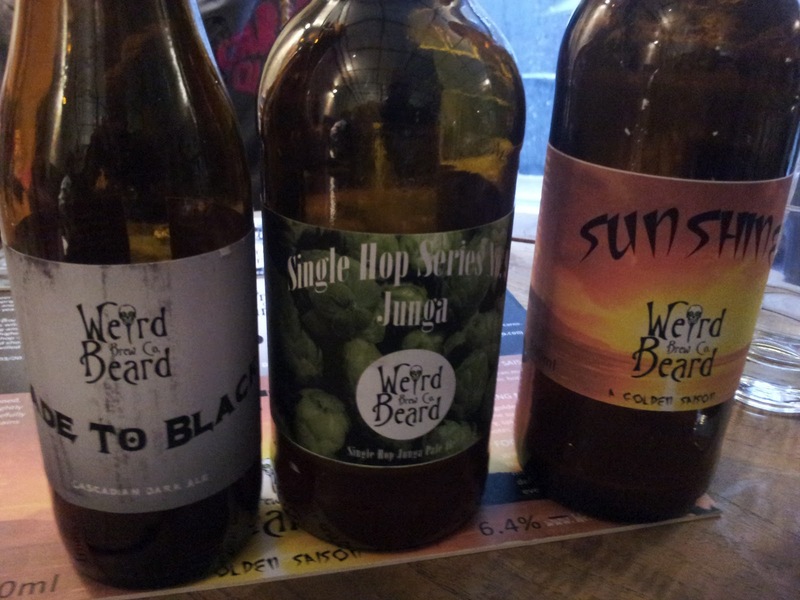 Until Weird Beard finds out what their allocation is, the plans for the initial range of beers can't be finalised and they're expecting to have to tweak and adjust recipes based on what's available to them when they start brewing. 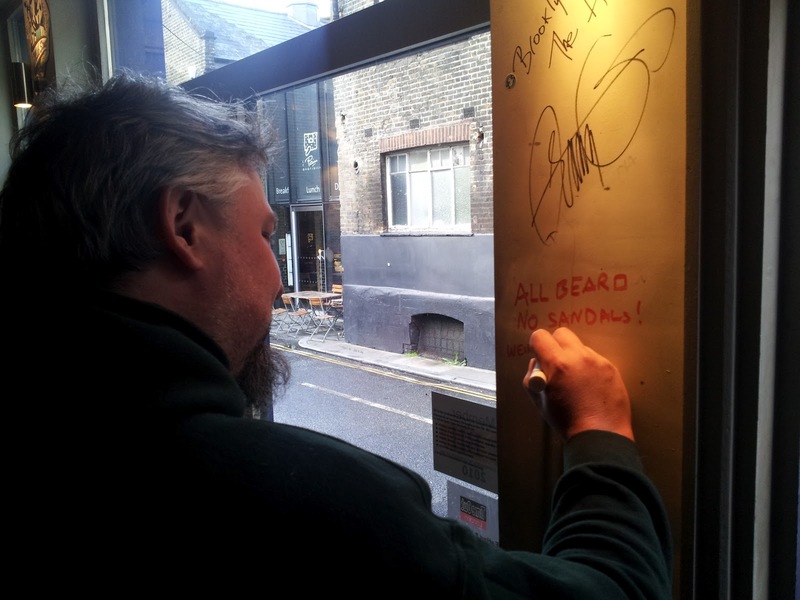 Bryan adds his signature, just below that of Garret Oliver! 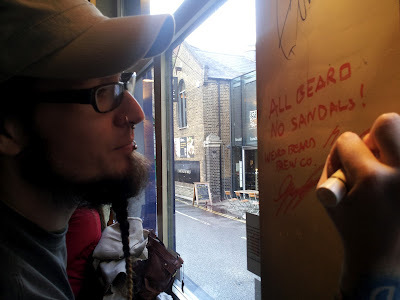 The rest of the afternoon was spent sharing and talking about some of great beer The Rake has to offer and I was glad I took time out to go and meet team Weird Beard. Their passion for good beer and brewing is one they love to share over a beer or two. They'll certainly make a positive impact to the London brewing scene and if the beers sampled on that wet Sunday afternoon are anything to go by, will be one to watch with interest. Excellent, good to learn a little more about the men behind the beards and see their plans moving forward! Cheers David. They are both really nice guys and I wish them every success. What a great idea getting this on at the Rake, fair play to them. Great to hear about new exciting start up breweries especially with folks I sort of know at the helm. Looking forward to getting a bottle or two in when available. Agreed - The Rake has always been good at supporting new breweries and showcasing good beer. Talking to the guys yesterday they were really pleased to have the opportunity to do the event and both were grinning like cheshire cats as they signed the wall! 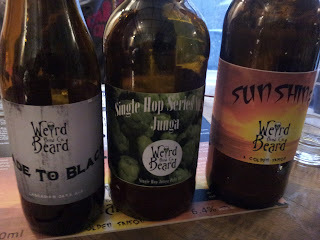 we hosted a similar meet the Weird Beard Brewer session at our recent Egham Beer festival and their 3 offerings were very well received ... Decadence Stout, South Sea Pale and Five O'Clock Shadow on that occasion. That's great to hear Bob. Hopefully next year you'll be able to carry a cask or two at the festival.